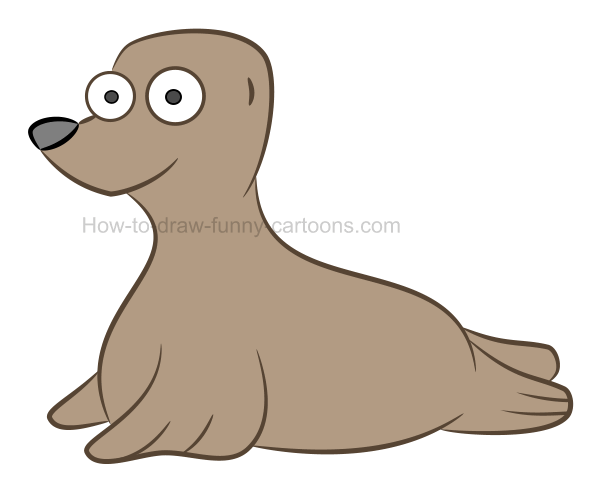 Learn how to create a cute baby seal made from basic shapes and filled with great colors, shadows and textures. 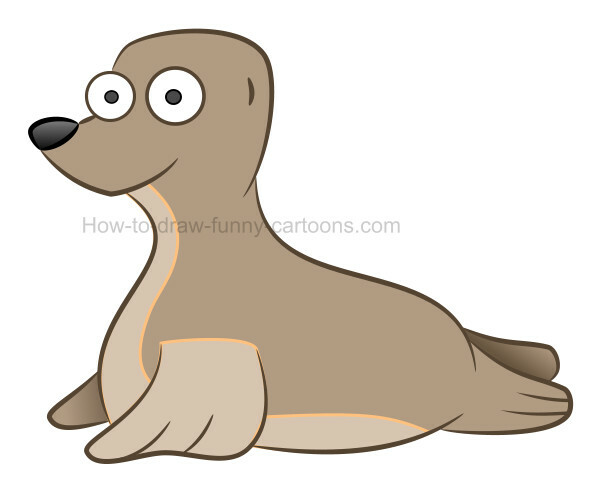 If you want to learn to draw a fun sea animal that is adorable and easy to illustrate, then this lesson is definitely for you. The nose is large and made from an oval shape. Both eyes and pupils are drawn using small circles and dots. The head is created from a square with round corners. Don't forget to draw the ear on the side of the head. Patches can be found on the back of this cute baby seal. Flippers on the back are short and round. More texture is visible on the chest of the animal. Front flippers are larger and very bright. Another bright area can be found below the neck. The mouth is closed and done using a broken line. 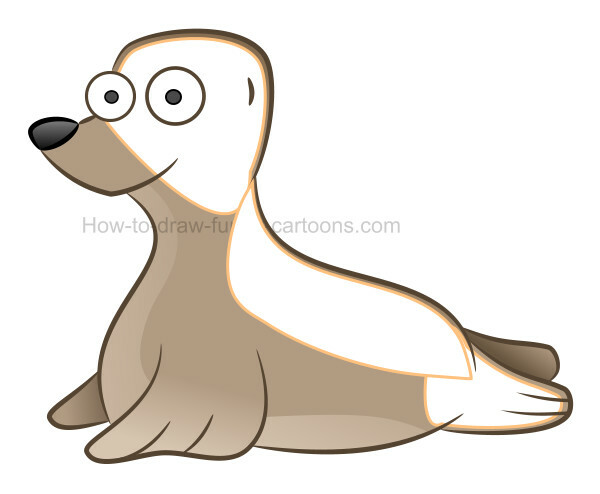 First, let's sketch a few basic shapes to help us illustrate our cute baby seal. You can start by adding a square to form the head. The body, the nose and the back flipper are made from various oval shapes. 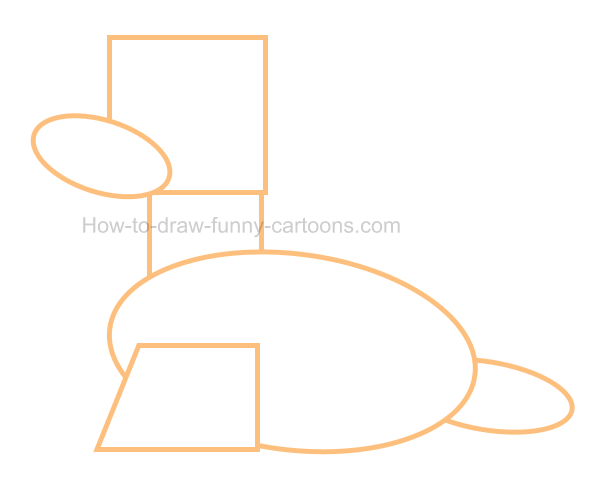 You can complete this step by drawing the front flipper and the neck using more squares. step 2 - Let's draw the character! This is the most crucial step of this lesson! 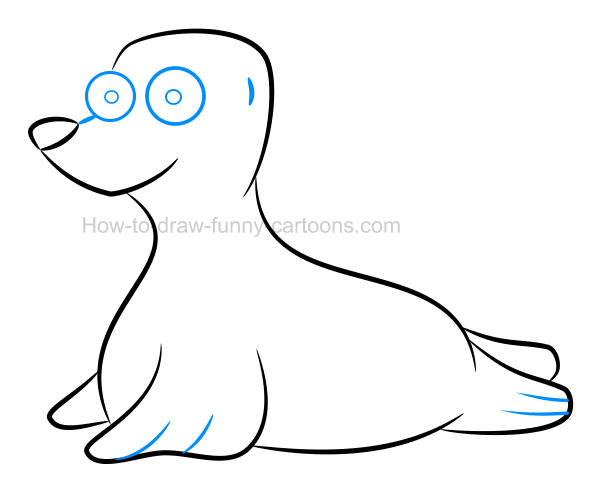 It's now time to draw this cartoon seal using long curved lines. Make sure the head is made from one perfect line and that all flippers are drawn accurately. The mouth and the nose are also areas that must be drawn with precision. Once you are finished, you can erase all orange shapes created earlier. Inside the head, work on the eyes and the pupils using large circles and dots. To create a little bit of perspective, you can make the right eye slightly larger than the left one. The ear that is visible is done using a short line and more lines are added inside the front and back flippers. Seals can be brownish or grey. In this case, I have selected a color that is closer to brown. The pupils are almost black while the nose is grey. Both eyes can remain white. I also modified all outlines using a dark brown color (instead of keeping the original color, which was black). In this illustration, you can see one back flipper and one front flipper that are located on the far side of the character. To create some depth, you can use the gradient fill tool (if you are using a vector application) to create a little bit of volume. You can use the same technique inside the nose. The chest and the front flipper are filled with a brighter color as shown in the illustration below. You can apply some transparency to make the effect even more interesting. For example, the new shape added on the front flipper can be plain on the bottom and hidden on top. You can see the final result in step 7 since in this one, transparency was not applied. Just like we applied some brighter areas in the previous step to create more volume, we can also sketch dark shapes to increase the depth of the character. These new elements are added on the head and the back. Transparency is also applied to partially hide the bottom of these shapes. You can see the end result in step 9.
step 8 - highlights to create a cute baby seal! 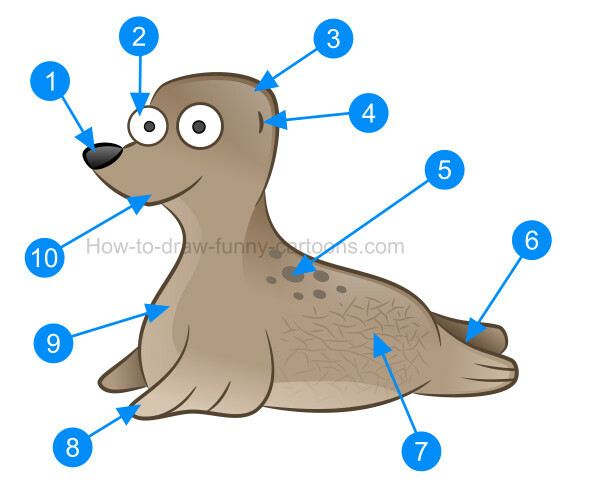 Yes, in this step, you also need to create brighter shapes on the head and the back of this cute baby seal as shown below. You can also add a third white shape on the back flipper of the character. Once again, transparency is used to create a professional result that can be seen in the next step. You can now see how adding darker and brighter shapes on the character's head and back can look like. 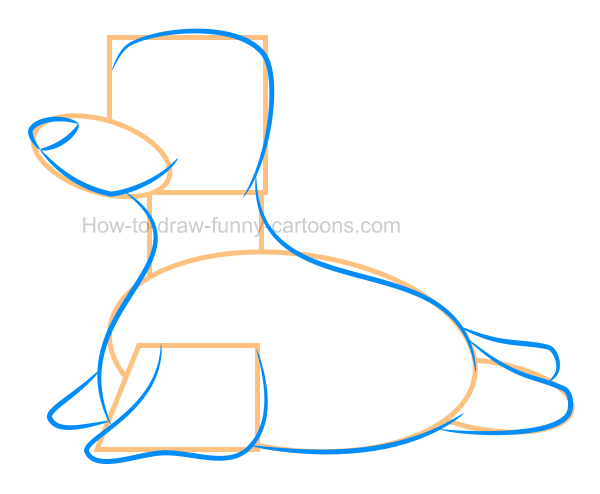 For this step, simply draw a few lines on the body of the animal (shown in orange here, but these lines must be brown). When you are done, apply some transparency. On the back of the animal, draw a few oval shapes that can be filled with a dark brown color. These new shapes are shown below with an orange outline. You can also see how the texture created previously should look like once all effects are added. This is the final version of our cute baby seal. See how the character is visually appealing and interesting once textures, colors, highlights and shadows are visible? Congratulations! This Lesson Is Finished! Below you can see all steps required to illustrate this animal properly. Sure, this character can be tricky to draw (especially if you want to include all digital effects), but simply study all steps carefully and you will be fine. Take your time, practice as often as needed and you will succeed for sure! You can also try more characters from the same series and create even more beautiful animals in just minutes!